An interesting week, two separate cyclists, two separate injuries, both caused by cleat placement. As an aside, this is a shameless plug for my friend, Jerry Durham who also happens to be an extraordinary Sports Medicine Physical Therapist and maniac Century cyclist. If you’re a cyclist with injuries, need rehab or want a custom bike fitting from someone who knows and understands the biomechanics of cycling better than anyone I’ve ever met, then Jerry is you guy. Cyclist #1: Numb toes only when cycling distances beyond 14 miles. Return of sensation usually complete by next morning. Hills, speed or terrain don’t affect onset, but distance does. Evaluation of his cycling shoes, showed that they fit perfectly. Evaluation of his cleats, showed that they were not positioned squarely under the ball of his foot but had been moved forward by the bike shop. 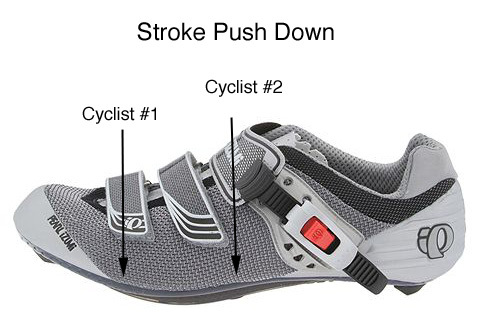 With a forward positioned cleat, the push down part of his stroke shifted his body weight in the shoe and because the forefoot of the cycling shoe angled up, when his body weight pushed down, it caused his forefoot to flatten due to the forward cleat placement. This in turn caused nerve compression, leading to numbness. Once we moved his cleat back the numbness stopped. Cyclist #2: This patient presented with a stress fracture right, 2nd metatarsal shaft (midfoot). Patient started riding to work 20 miles both ways, 10 miles downhill in the morning, 10 miles uphill after work at 5pm. Patient pushed himself harder and harder during the end of day ride and pleased with his efforts (and screaming endorphins), he decided to train for a Century ride. Committing to a new personal best each day, it was no wonder his foot was the only injured body part. 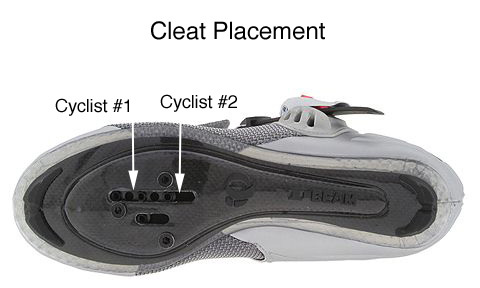 Evaluation of his cycling shoes showed the exact opposite cleat placement from the cyclist above. Take home message – Check your seat height and check your cleat placement. Oftentimes, cycling ball of the foot numbness can be alleviated with Superfeet, but if not – check where your pedal clips in. This entry was posted in Sport Specific Shoes. Bookmark the permalink. i have been in a spin class for 8 mo.. recently i have developed chronic rt arch foot pain to point difficult to walk for several days after class. i have severe flat feet that pronate inward-no arch at all. i am cycling with the cage on pedal. would cleats be better for the foot problem? problem is worse when standing and climbing.